6 Formation??? 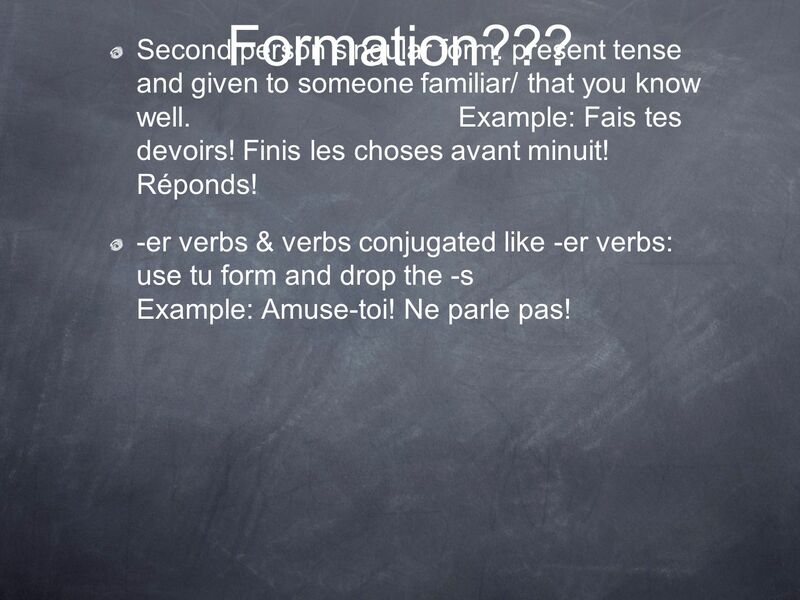 Second person singular form: present tense and given to someone familiar/ that you know well Example: Fais tes devoirs! Finis les choses avant minuit! Réponds! 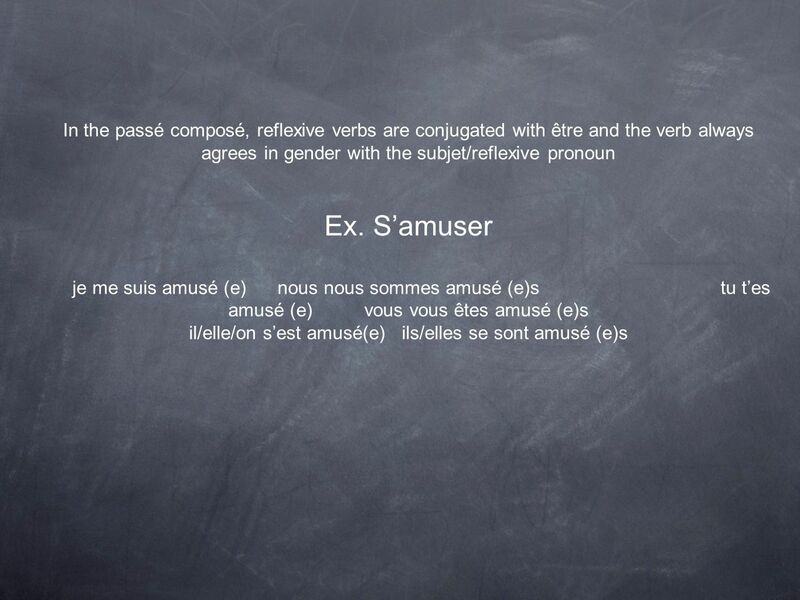 -er verbs & verbs conjugated like -er verbs: use tu form and drop the -s Example: Amuse-toi! Ne parle pas! 7 Formation??? 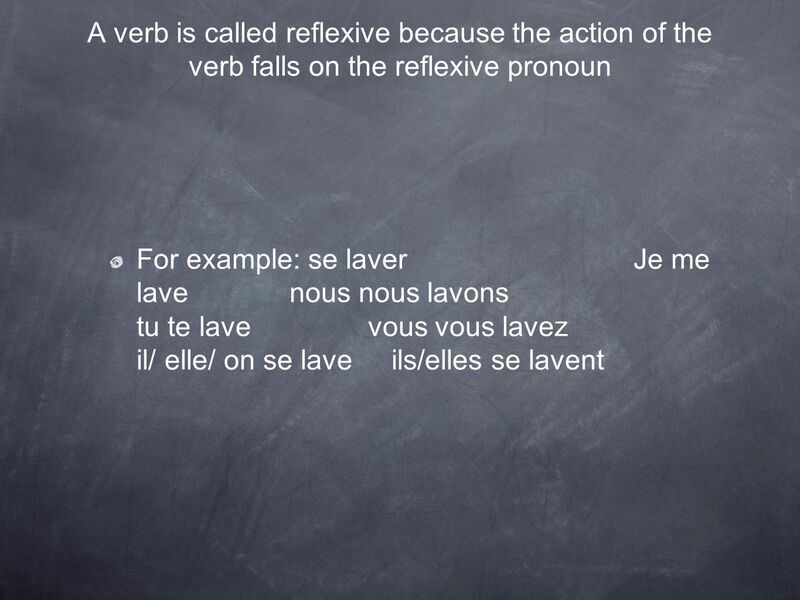 Reflexive verbs keep the pronoun & te changes to toi when following the affirmative imperative form Example: Amuse-toi! Débrouille-toi! 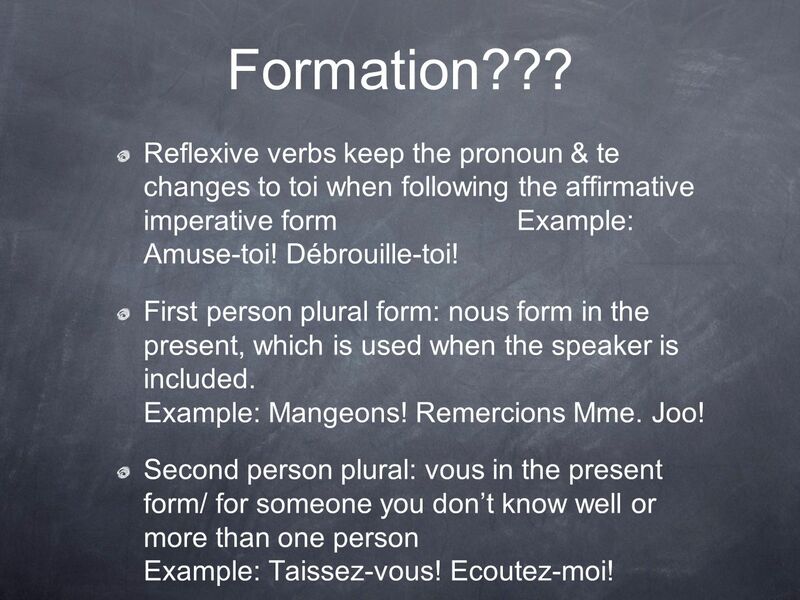 First person plural form: nous form in the present, which is used when the speaker is included Example: Mangeons! Remercions Mme. Joo! Second person plural: vous in the present form/ for someone you don’t know well or more than one person Example: Taissez-vous! Ecoutez-moi! 8 Important... If the second form singular (tu) is followed by y or en giving a command, then -s is retained for easier pronunciation Example: Vas- y! Manges-en! 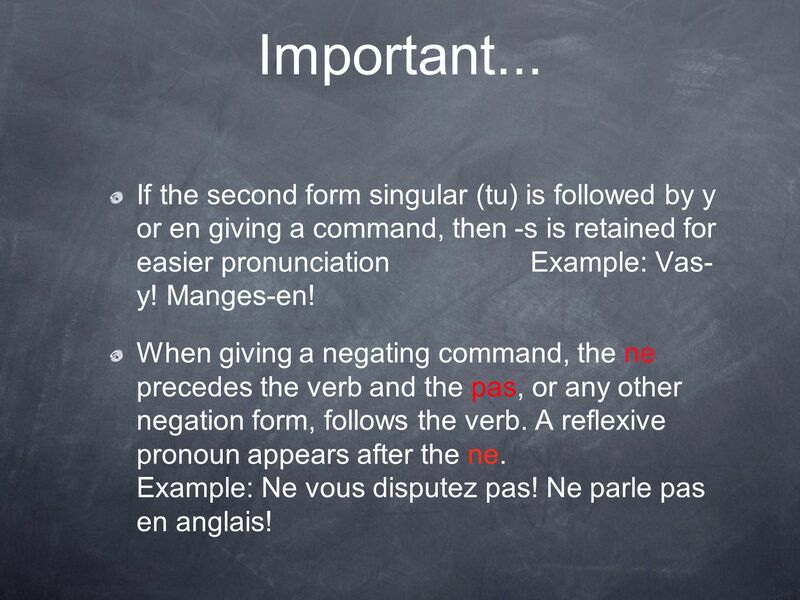 When giving a negating command, the ne precedes the verb and the pas, or any other negation form, follows the verb. 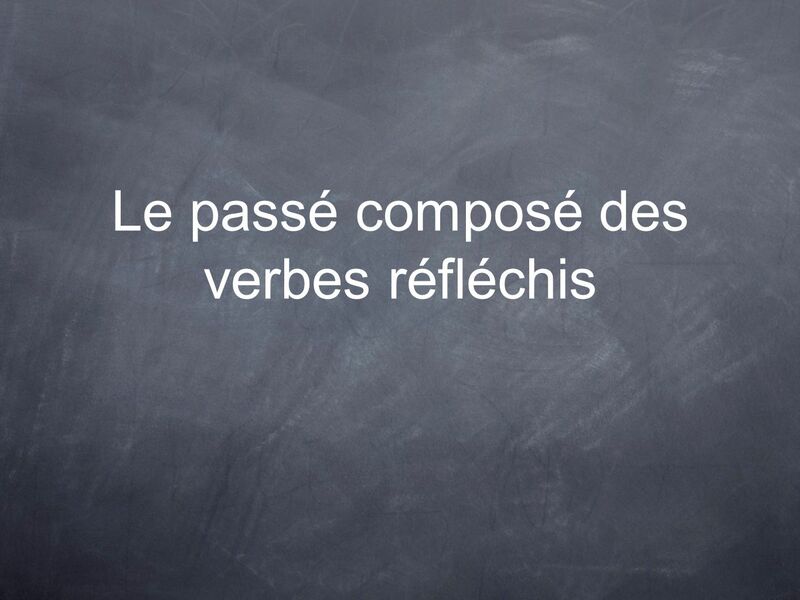 A reflexive pronoun appears after the ne Example: Ne vous disputez pas! 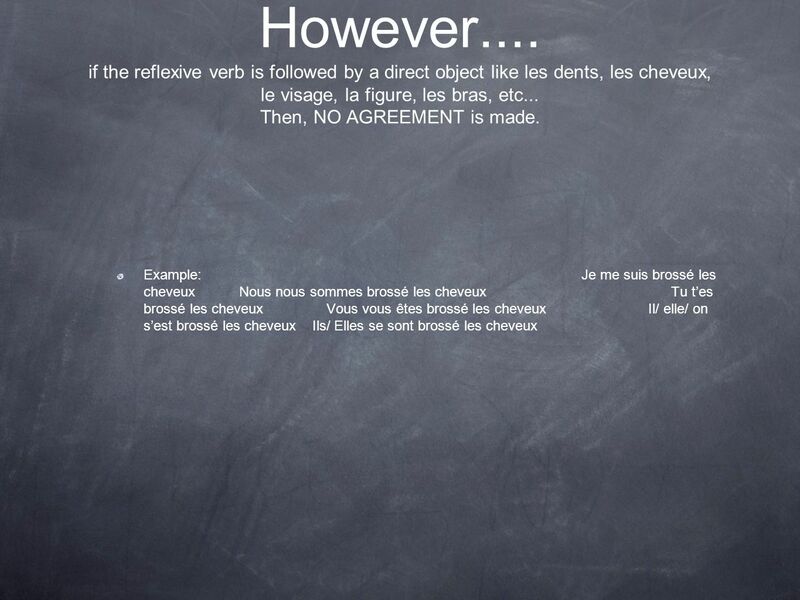 Ne parle pas en anglais! 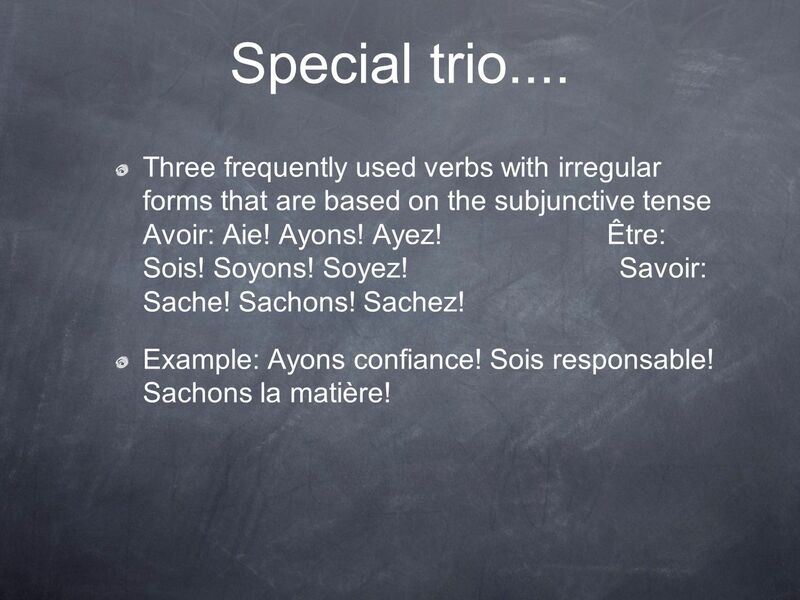 9 Special trio.... Three frequently used verbs with irregular forms that are based on the subjunctive tense Avoir: Aie! Ayons! Ayez! Être: Sois! Soyons! Soyez! Savoir: Sache! Sachons! Sachez! Example: Ayons confiance! Sois responsable! Sachons la matière! 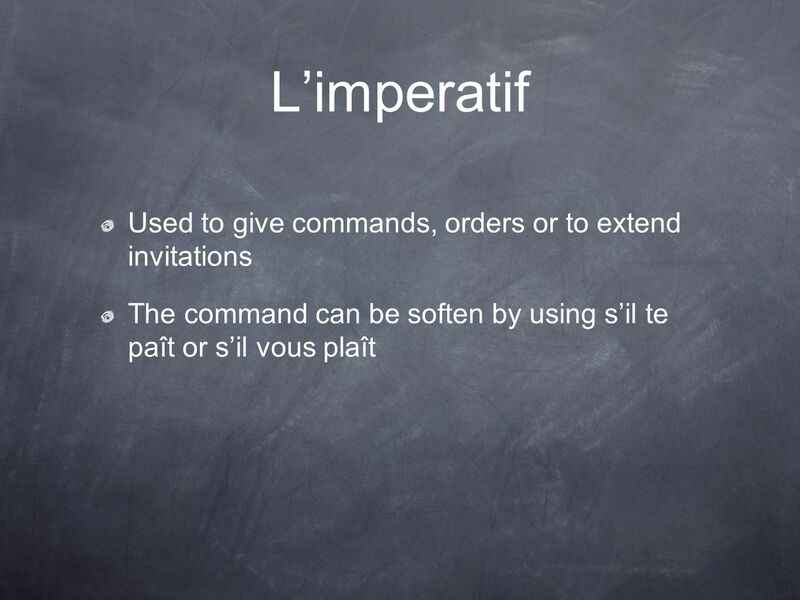 Télécharger ppt "Le passé composé des verbes réfléchis"
A L’impératif des verbes réfléchis p. 303 Note the affirmative and negative forms of the imperative of the verb se reposer (to rest). AFFIRMATIVE NEGATIVE.